Hello again dear space friends and welcome back to another structure blog from Team Game of Drones. As we have been riding the Fanfest hype train and gathering feedback from the forums and other communication channels, we decided it was time to bring more details to chew on. So, take a seat by the campfire and grab some marshmallows while we give you some updates on our structure overhaul plans. Since the scope of a full structure overhaul is larger than the Stay Puft Marshmallow Man, we had to play smart and focus our efforts into one structure role at a time instead of crossing the streams everywhere. There is difficulty involved in picking which one of those roles to start with. Since the first structure we release is going to require core mechanics to work, like fittings, deployment or even management, we need to make sure the foundation is solid while still delivering an interesting package for players to enjoy. When that is out of the way, it will significantly speed up development time for more advanced structure roles that have their own new mechanics but still require the core gameplay listed above. We will spare you the endless debates, bartering sessions and casualty reports coming out after locking two dozen EVE developers in various meeting rooms and go straight to the point: we have decided to start with Market and Office Hubs, but with a twist. Since we like giving you a place you can call home and collectively interact with, be it for cooperative or competitive needs, this role is ideal to start with. At the same time we want to achieve much more than just adding a fresh coat of paint on existing structures. We want to develop their use in the EVE universe and develop excitement as a whole. “Market and Office Hubs” sounds a little bland, like another day at the office dealing with a grumpy boss and an unreliable coffee machine. How about we spice that up a little bit? Of all the structures, we want these to be the most dedicated to asset safety, protection, and a feeling of home – just like when you are tucked inside your bed sheets while the elements rage outside. At your coziest you should be fortified in giant bunkers equipped with mega death rays to weather the storm. As such, we are slightly changing the purpose of the Market and Office Hubs structures and renaming them “Citadels” to give a better approximation of what they do (note: I initially wanted to have them called “space châteaux” but got rejected by a team full of damn barbarians who don’t know what good French taste is). In time they will still retain the other functionality mentioned (Market, corporation offices, cloning, insurance, character customization, Customs Office and potentially Interbus), as we release new service modules. 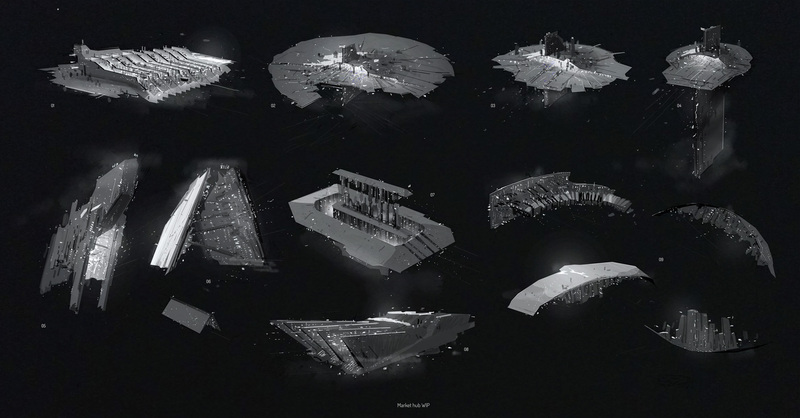 CCP Nag and CCP Maximum Cats have scattered a few concept arts for the Citadel structures within this dev blog for you to feast your eyes upon. As usual, please remember those are still work in progress and may not represent final look. As mentioned during the Fanfest presentation and associated Dev Blog, structures are sorted in various shape and sizes. Citadels are no exception. Medium sized Citadel structures will be around 5-25km in diameter and are tailored for individual or small groups of players. They will be able to fit some appropriate defenses to offer resistance against most kind of assaults including capital ships. 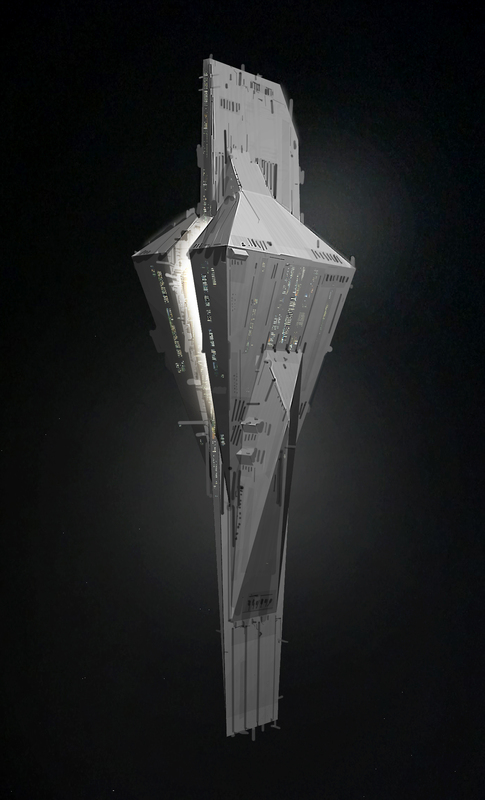 Moreover, players can dock inside them with sub-capital ships. 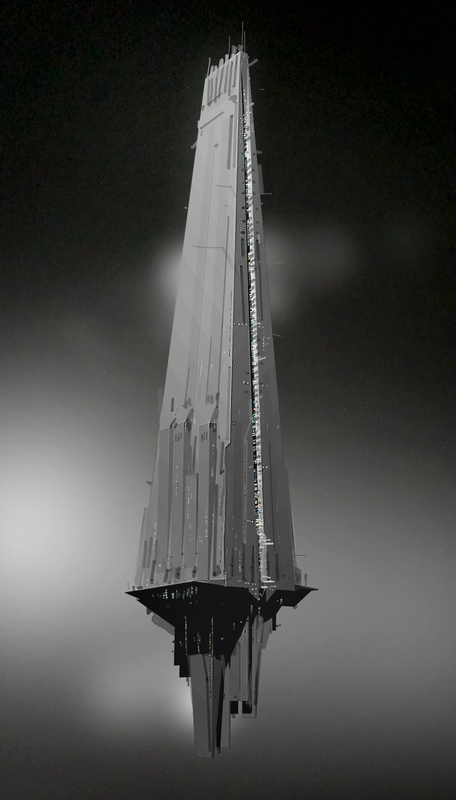 Large sized Citadel structures will be around 25-50km in diameter and are made for corporations or even small alliances. They will offer more advanced functionality over medium-sized Citadels, mainly in the form of area of effect (AoE) defenses and facilities that are more tailored to support large fleets. While players will be able to dock with sub-capitals, capitals are still up to debate at this point. X-Large sized Citadel structures will be around 100km in diameter and are specialized for high-end alliance gameplay. On top of the mechanics listed above, they will have the best defensive options to face against particularly large groups and allow capital ships to be docked (even maybe supercapitals--to be discussed). Most if not all of those structures will have a replacement for the current Starbase forcefield with the use of the invulnerability link (final name to be discussed), which will ensure safety for friendly ships within a specific radius. This will not cause your ship to stay in space when logging off. Sizes also determine their release order. We will start by focusing on Medium and Large Citadels, since we believe they offer gameplay that extends to most player groups. They also are a lot simpler than X-Large Citadels to design and implement. When Medium and Large Citadels are out and we have gained some experience through them, we will then deploy the X-Large variation which offer much more challenge in their conception due to their humongous sizes and intended use cases. As mentioned during the last blog, we also have given some more thought on how players will be able to take structures out. Small structures, which are going to assimilate existing deployables, cargo containers and mobile warp disruptors will still be able to be directly shot by players. 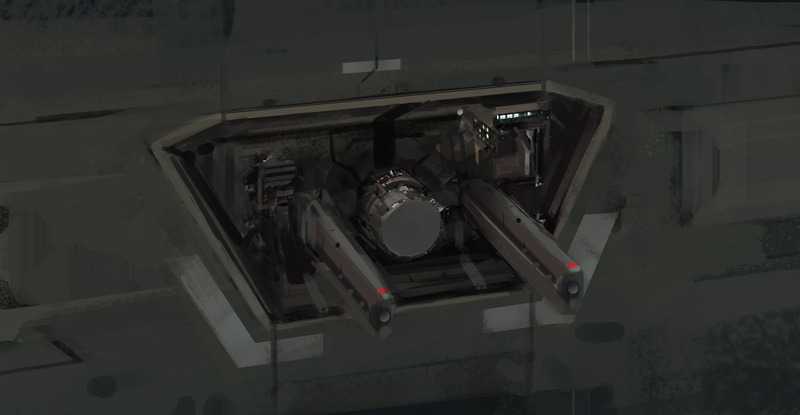 Some exceptions may be kept around for the time being, like the Mobile Depot having a reinforcement timer on their own. Medium, Large and X-Large structures will use a version of the Sovereignty capture mechanic, which means they will only be attacked through the use of the Entosis module. Please refer to this blog for more information on how that works and this blog for an update to those plans for this summer’s Carnyx and Aegis releases and beyond. Unlike existing Outposts, nothing is to prevent us from having the new structures destroyed after a successful Entosis capture. Those structures will use the same principles of vulnerability and reinforced states from the Sovereignty overhaul. The structure can only be attacked by Entosis modules when it is vulnerable, and is invulnerable when reinforced. The difference between normal and reinforced modes remains that penalties may be applied to the structure in the latter case (like jobs stopping for instance). The number of vulnerable and reinforced states depends on the size, role and importance of the structure being attacked. Example: Capturing a Large Citadel structure could require attackers to go through 3 vulnerability phases before it is destroyed, while a Medium Observatory Array may only require 2. While the capture of X-Large structures will require the use of Command Nodes just like Outposts, the various timers and mechanics fine tuning will vary depending on the structure balancing. Scooping a structure will require it to be offlined first. Offlining a structure will immediately put it into a vulnerability window (to avoid players bypassing the timer altogether). If a structure already was in a vulnerability mode while being offline, the duration will be refreshed to its full value. 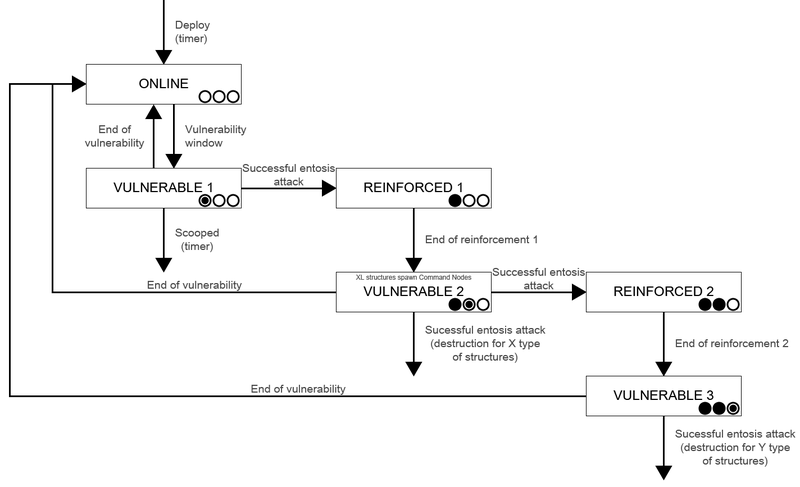 Example: A structure vulnerability window lasts for 2 hours. Offllining the structure will immediately put it into a 2 hours vulnerability window. If the structure only had 1 hour of vulnerability window left when being offlined, the window will go back to 2 full hours. Structures will drop fitted modules through the same loot mechanic than ships, but corporate and personal stored items inside them will not be affected – this will be handled through asset safety mechanic which we quickly explained in the previous Dev Blog and shall be more extensively tackled in a later blog. Destroyed structures will leave wrecks which can be salvaged just like ships. What they contain will most likely be some of their built materials although this is still highly speculative at this point in the design process. Structures having a solar system wide-effect or otherwise impacting some kind of area will be publicly visible in space and in the overview like standard celestials. The same principle applies to structures that the pilot is allowed to interact with. Example: an alliance member having sufficient roles to interact with an Assembly Array will see it displayed in space / overview. A neutral pilot will not see it there however. All structures will show on D-scan, can be probed, and will be scannable to see their fittings and contents. We are also thinking of having them visible and directly warpable from the on-board scanner to preserve Wormhole space gameplay. We have established Citadels need to be able to take care of themselves in a fight. While structure weapon systems will deal considerable amount of damage to compensate for their static nature, most of them will require Electronic Warfare assistance from defending ships to be fully operational (like Stasis Webifiers or Target Painters). While Citadel structures are specialized in repelling attacks (through specific bonuses and attributes), keep in mind most structures will be able to fit defensive options--if they have enough slots and fittings of course. With that in mind, let’s have a look at what we are planning so far for defensive modules. Also remember this remains work in progress and is susceptible to change. They are either going to be turrets or missiles (or maybe even a combination of both) which can be fitted in M, L and X-L structures, but only exist in 2 variations based on their role. Unlike ship weapons, they will not exist in multiple sizes themselves – we’ve investigated that option but felt it was not worth the small variety it brought next to the extensive design, technical and skill training costs. 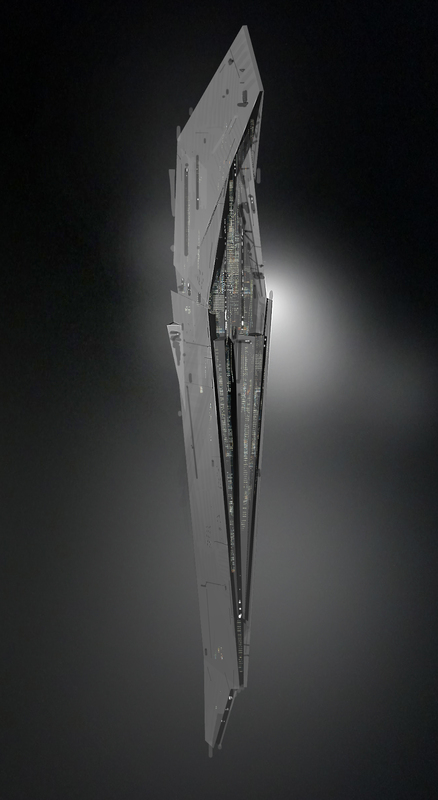 One long range weapon, primarily meant to take down large and slow ships, like battleships or capitals. Can be fitted with ammunition that reduces range but increases damage proportionally. One short-medium range weapon, best at taking down smaller threats, but doing considerably less damage. Can be fitted with ammunition that reduces range but increases application proportionally. They are going to require a new line of skills to operate, but most likely use existing gunnery and / or missile support skills. More details as we get them. This particular weapon type is going to revive the torpedoes of old since they release an AoE blast on impact. They are meant to be particularly effective against fleets that cluster together. 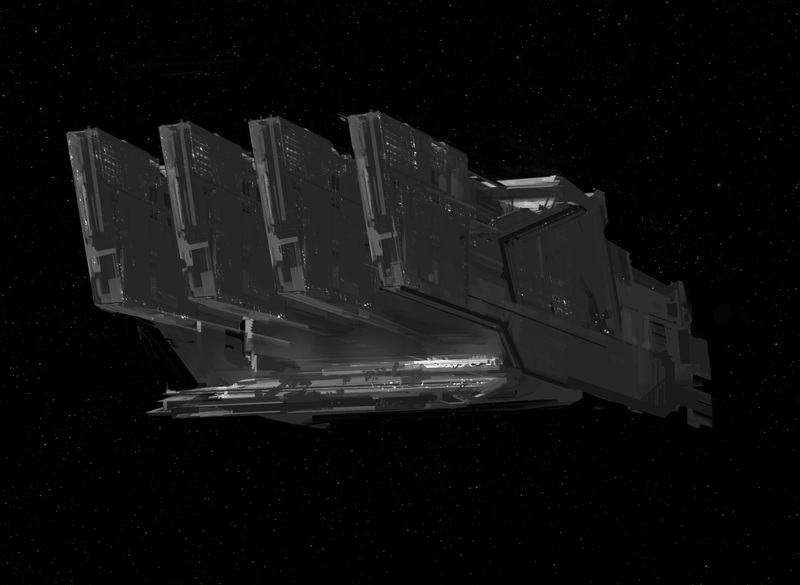 They can be fitted in L and X-L structures only and be loaded with blast charges aimed to either take down slow and large ships or small and fast ones. An extra option is to use energy draining missiles which make them work like targeted bombs. Please note this launcher won’t be available for high-security space structures since they make no distinction between friends or foes. Energy Neutralizers are part of the utility high-slot suite of defensive modules and drain capacitor from the targeted ships. Their effect works exactly in the same manner as their ship module counterparts. They remain available for L and X-L structures. The first with a short cycle and small drain amount, again aimed for sub-capital targets. Another with a very long cycle and large drain amount intended to be used against capital ships. We are planning for structure to have drones as of one of their available weapon systems. Number and various bonuses given are going to vary depending on the structure type and size – larger ones could be focused towards fighter and fighter-bombers instead of regular drone for instance, but this is pretty much open at this point. Structures will be able to fit their specific variations of Electronic Warfare modules we all know and love. They include, but are not limited to: ECM, remote sensor dampening, stasis webifiers, tracking disruptors, target painters and warp disruption. We are considering the introduction of area of effect variations of those modules later on. Single target modules will be available for all sizes and locations, while AoE effects will most likely be restricted by size and security status. This particular module will be similar to a smartbomb – by doing a certain amount of area of effect damage to anything close to the structure. 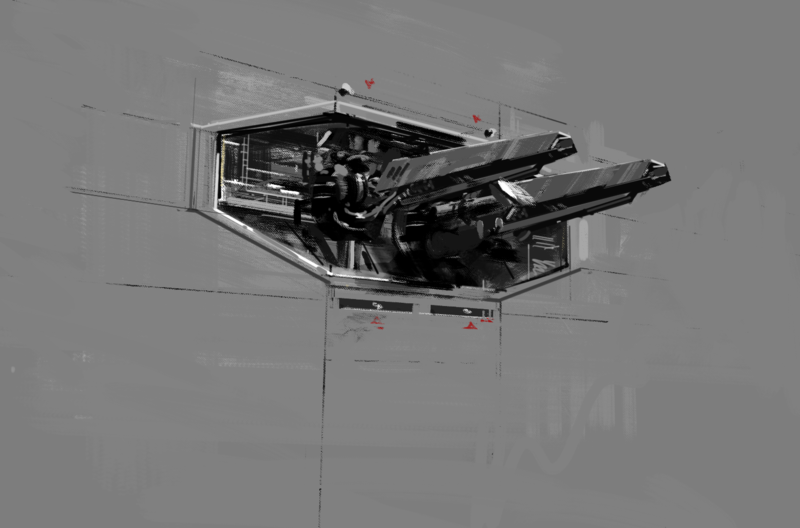 As they are intended to clear drones or small deployable clutter near the structure undock points, they will have a constant damage but low reach. This will only be available for large and X-Large structures and cannot be used in high-security space. The Doomsday weapon will only be available on the X-Large structure, and have a similar purpose to the ones installed on Titans. However, it will have extra capabilities next to its ship counterpart to compensate for the single, static nature of the structure on the field. For instance, we are considering a weapon that bounces off multiple times after hitting its main target, a bit like another weapon we’ve shown in the past. And that’s it for now, we hope this answers a few of the questions you may have had, and most likely add a lot more into the fray. Please remember we still are at the beginning of the development process and many more Dev Blogs are due to come at a later date.